Before you begin your SI Joint Treatment you should understand a little bit about this joint, or actually, one of two joints in your pelvis that connects the tailbone (sacrum) and the large pelvic bone (ilium). The sacroiliac joint(s) connects the base of your spine or the sacrum to the pelvis or ilium. The Sacroiliac Joint is not designed for much motion. In this way it is unlike most others in the body that are very mobile such as the hip and shoulder. 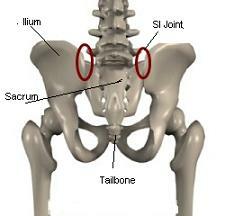 Here lies the many problems we have with the SI Joint, it becomes stiff and actually “locks” as we age! Also, because of its location at the base of the spine, it absorbs all the shock and compression from years of bad posture, weak muscles, disc degeneration as we age, and just being alive. SI Joint Treatment should consist of manipulation and mobilization techniques through SI Joint Stretches and exercises that you or a therapist can perform. Once you determine the cause of your SI Joint pain you can begin your treatment. The pain may be caused by a variety of things such as: twisting or bending in a way that triggers the sacroiliac joint pain, infection of the SI Joint, osteoarthritis, trauma, stress fractures, or inflammation of the SI Joint. How can Pilates help with your SI Joint Treatment? First, understand that Pilates works to correct all those muscle imbalances that we have caused our bodies through years of abuse. Bad posture from atrophied muscles that have become too weak to hold us upright, bending, twisting incorrectly, trauma from auto accidents, and other accidental injuries. We can’t help how we abuse our bodies, that’s just life! But now we are paying for it and it hurts! I will list some of the most effective SI Joint exercises that can do both; stretching and strengthening. 1. Lying on your back with one knee pulled to your chest and the other leg extended at a 45 degree angle. Head and shoulders are lifted using your abdominal muscles to support them. 2. Switch legs pulling the bent knee deep into your chest and flattening your abdominal muscles as you breathe in and out for 10 repetitions or until your abdominal muscles tire from holding your head up. 1. Lying on your back with your knees bent and feet together. Place your hands on your hip bones and make sure they stay even or parallel to the sky. 2. With an inhale press your knees apart or out to the sides until you feel some tension or tightening on the outside of your hips. Stay there for a second and then exhale as you squeeze them back together. Repeat for 8-10 repetitions working to get more range of motion. These are just a few of the many different ways to mobilize and strengthen the sacroiliac joint. Find more ways in my Pilates ebook here. 1. Lying on your side with hips and shoulders aligned and knees bent. 2. Squeeze your heels together and open the knees apart without rolling the hip open. Feel the work deep in your glute medius or in the hollowed out area in your buttocks. Do this for 8-12 repetitions. If done correctly you should feel it within a couple of reps.
1. 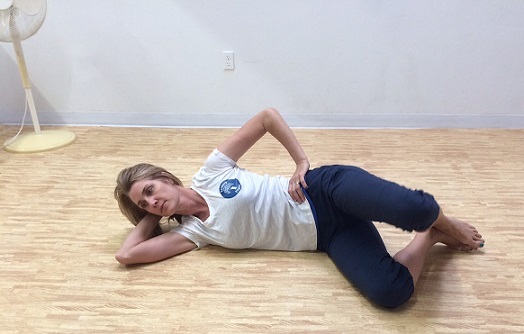 Lying on your side with hips and shoulders aligned and bottom leg extended. 2. Use your top leg to make a bicycle motion keeping the waist long and pelvis stable to help with your si joint treatment. Repeat this for 6-8 repetitions then reverse the direction. Leave SI Joint Treatment and find out how Pilates exercises can help you with other hip and joint issues.